The New Year tends to bring out our adventurous spirits and inquisitive minds. New jobs, business start-ups and lifestyle changes are dreamt up over the summer holidays and either fledged or shelved come February. 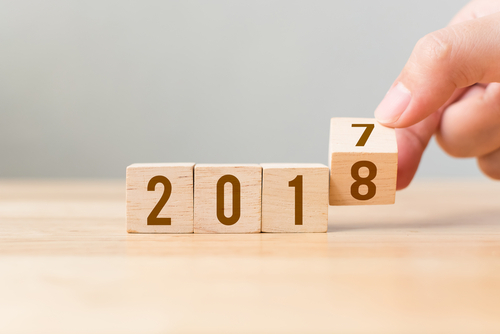 Whatever your plans are for 2018, we wish you success and confidence in what you do. The Small Business asset write-off for items costing less than $20,000 ex GST will end on 30 June 2018. This has been in operation for a few years now and many of you have taken the opportunity to upgrade your equipment and practice. If you have any other plans for using this concession we suggest that you act sooner rather than later as the pre-June rush with financiers and banks may make this difficult. The US has recently reduced corporate tax rates from 35% to 21% and allowed for capital expenditure to be claimed at the time of the outlay. France will also reduce their company tax rates to 25%. In 2017/18 the company tax rate in Australia is 27.5% for businesses with a turnover not exceeding $25 million. No further reductions in the rate are planned until 2024/25. Information from Treasury is that the Australian budget is still on track to get to surplus in 2020-21. It will be interesting to see if there will be further concessions available to Australian small to medium-sized businesses in this year’s budget. Holidays make everyone feel better. A break from the daily grind will make you a happier person at work and at home. Now if we could find a way to claim our travel expenses as tax deductions we’d be able to have our cake and eat it too, right? Trips to visit rental properties are usually more effective for clients when tacked on to a holiday – which might be part of the reason that the ATO have denied this type of travel from 1 July 2017. It doesn’t matter if the property is by the beach, next to a ski run or on the Italian coast; travel to inspect rental properties no longer an option for individuals. How about an overseas conference then, I hear you say? Travel to and from the conference will certainly be deductible however side-trips and indirect travel will have to be removed. Extended or overseas trips may also require diaries to substantiate your claim. It’s easiest to work out what is claimable and what documentation you need before you travel, so contact us just after you’ve got the itinerary from your travel agent and we’ll help you work out the claim. The ATO are moving the Small Business Superannuation Clearing House (SBSCH) into their online lodgement suite. From February 2018 you will be able to report employee superannuation via the Business Portal using your AusKey. Clients not currently using the SuperStream capabilities of their payroll software are encouraged to either upgrade their software or obtain an AusKey to meet their SuperStream obligations. Most clearing houses will take between 3 to 5 days to process your employee’s super payments and pass them on to the respective Super Funds. If you have this issue, we recommend that your monthly and quarterly SGC payments are made by the 21st of each month to meet the deadlines set by the ATO. While not everyone has jumped on the cryptocurrency bandwagon, I’ll bet that you know someone who has! If you are interested in the hype, find out how the purchase and sale of cryptocurrencies will affect your tax return. From 1 July 2017 the ATO have confirmed that digital currency is GST free. Prior to this however the transaction was a taxable supply. There’s the good news. Gains and losses made from buying and selling digital currencies can be taxable or deductible depending on the reason you bought it in the first place. Are you a long-term investor? For small investors, gains are likely assessable however losses may not be deductible. Perhaps you have purchased bitcoin to buy goods from overseas? Business transactions will form part of your taxable income and deductions. Everyone’s situation will be different. If you have any questions in relation to the tax treatment of these transactions, call us rather than taking advice from that charismatic guy at last weekend’s BBQ. The ultimate goal for most business owners is to see their legacy passed on to another generation. Many years will be spent building your business and creating both an income stream for your family and an enjoyable workplace for you. So how do you know when you’re ready to sell? It might be that your industry landscape has changed, health concerns or you have been approached with an offer that can’t be ignored. There will be a day that you no longer want to go to the office, and Synstrat recommends that you be prepared 3-5 years prior to that date if you want your transition out of the business to be successful. Synstrat’s qualified Accountants and Financial Planners are well equipped to help you get the most out of a business sale, both financially and personally. Contact us to discuss your needs further. * Payment needs to be received by the Super Fund(s) by this date. We encourage you to prepare your transfer in advance of this date to ensure the payment is deductible to you. The Synstrat Group provides Business Advice, Accounting and Financial Services. Prepared by Synstrat Accounting Pty Ltd for clients of Synstrat Group. If you are not the intended recipient of this communication please delete and destroy all copies of this message and telephone Synstrat on +61 3 9843 7777 immediately. If you are the intended recipient of this communication you should not copy, disclose or distribute this communication without the authority of Synstrat. Any views expressed in this communication are those of the individual sender, except where the sender specifically states them to be the views of Synstrat. If you do not wish to receive this email in future, please reply to the sender requesting termination of service.